An Australian pizzeria has taken an unorthodox approach to reminding patrons how their food is sourced, hanging a taxidermied dairy cow from its ceiling. The move has provoked outrage online for cruelty. 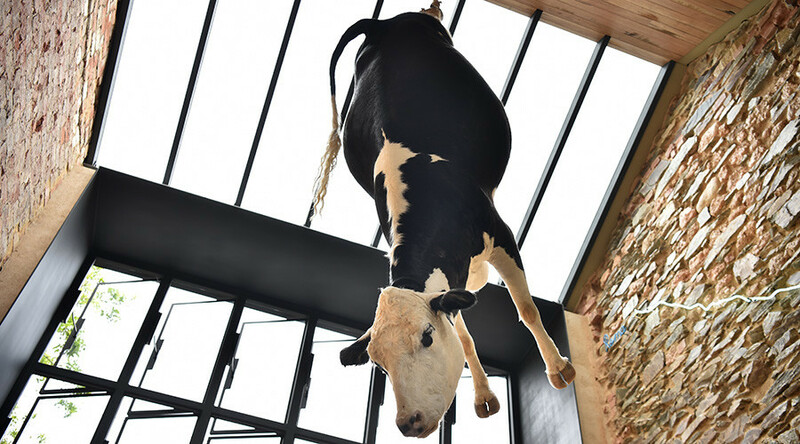 The Friesian-Hereford cow is hanging from the ceiling of Etica restaurant in Adelaide in order to call attention to the industrialization of the farming industry, according to owners Federico and Melissa Pisanelli. “It's talking about how the industry has become industrialized, and how it's moving in a way that doesn't keep up with consumers' perceptions,” Melissa told AFP. The controversial installation is also aimed at challenging the “idyllic view of happy cows in green pastures,” according to Federico. “It is confronting to look at a cow like that because it contradicts our usual representations of a dairy cow,” he added. The restaurant offers both meat and dairy options on its menu, but insists its animal products are sourced ethically. The Facebook post goes on to share the story of the eight-year-old former cow which currently hangs in the restaurant, who was affectionately known as ‘Schvitzy’. One critic responded to the display by creating a petition on Change.org, calling for the restaurant to remove the “unspeakable, atrocious, and shocking” installation. The petition has so far received 5,841 signatures. Critics also responded directly to the Facebook post, with one person telling the restaurant that consuming all of Schvitzy's parts is a “poor excuse” for justifying the bovine’s demise. One accused the restaurant of not caring about ethical issues at all, but instead merely trying to gain attention. However, there are two sides to every coin, and the restaurant received plenty of responses from those who support its mission. “Why not show what you are serving, I am a veggie and it does not bother me,” one person wrote. Another person said they “understood” what the restaurant was trying to achieve, as people are far removed from the process of how their food made it to their plate.